Eric was born in Anchorage, Alaska to his loving parents Mary Jane and Larry Hearn. He attended Milton High School in Alpharetta, Georgia. After high school he enrolled and attended the University of Georgia. In 1973 he began a law enforcement career with the University of Georgia Police Department. While starting as a patrolman he quickly rose through the ranks and worked in investigations and lastly was a Sergeant in charge of the Narcotics Division. While involved with the Narcotics Division he was detached to one of the first multi-jurisdictional task force for drug enforcement. 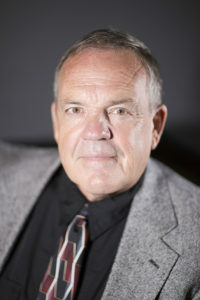 He graduated from the University of Georgia having obtained his accounting degree in 1976. Learning quickly he did not actually want to be an accountant, after receiving his undergraduate degree, he stepped away from the UGA Police Department and entered the University of Georgia law program in the fall of 1976. He graduated in 1978 and passed the Georgia Bar prior to even graduating out of law school. Right out of law school he opened up a practice with a classmate and had a general practice law firm. Two years later he joined Bridges, Connell, and Snow, where he eventually became a partner. Late in 1985, he was hired full-time as an Assistant District Attorney for the Griffin Judicial Circuit. His duties primarily focused on trial work and he emphasized “that’s what I did, I tried cases!” He recalls that is when I got a good dose of Virgil Brown. I enjoyed the fight and Virgil knew how to fight. After a few encounters with Virgil, I decided, with the D.A.’s approval, just to take all of Virgil’s cases. I would give him as good as he gives. We fought for years and soon we ended up respecting each other as advocates for our respective sides. In 1988, Eric and Virgil called a truce and became partners at Virgil L. Brown & Associates. Virgil and all the Associates routinely recognize that Eric has been a driving force in the success of this law firm. His near perfect recall of statutes and case holdings, management of the practice, and command and presence at trial make him hard to beat. When asked about his most memorable cases he emphasizes how difficult some cases were simply because of the nature and type of case and the consequences therefrom, especially, the death penalty cases. In those type of cases, the attention, time, money, and resources that these cases take to defend, and defend well, could and would nearly break our client, our system, and our business. Despite his successes in handling these cases he always kept a personal interest in the client, the community, the business, and the process because most of the time ,if not every time, we all paid some type of consequence.